The city of Edmonton is located in the western Canadian province of Alberta. 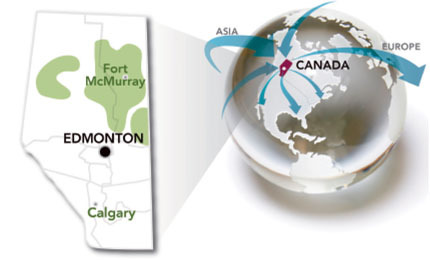 The Edmonton Energy and Technology Park (EETP) is strategically located as the major service centre for Alberta’s resource extraction sectors and Canada’s north. The EETP offers industrial investors ready access to major highways, Alberta's high load corridors, rail lines and CN's intermodal yards. Its urban location provides access to a large, skilled labour pool, a buoyant domestic market as well the major transportation networks to move feedstock and materials in and product out to market. Edmonton's transportation network connects quickly and cost-effectively to Western Canadian resources and markets. Our network connects industry nationally and globally. Edmonton has easy access to coal, agriculture, forestry, oil, gas and petrochemical feedstocks.